The Artsmith has new owners, but they're familiar faces in town. 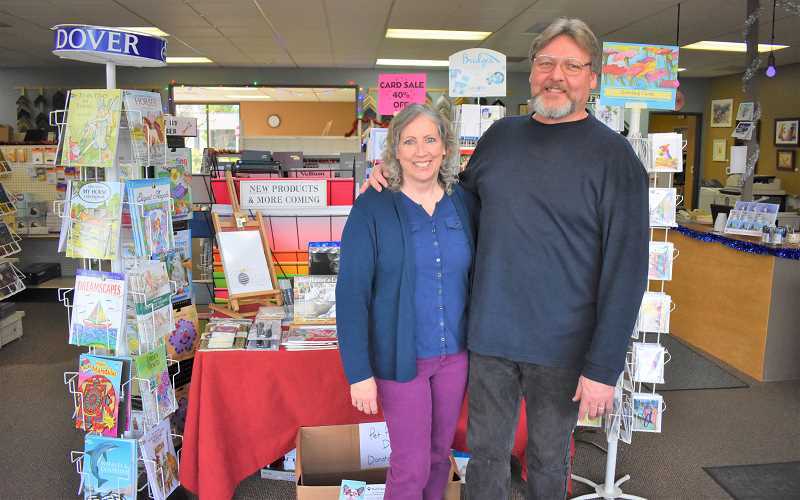 Longtime Estacada residents Dave and Ellen Anderson purchased the store at 155 S.W. Third Ave. Suite 101 in October. A grand opening celebration is scheduled for Saturday, Jan. 12. The couple is excited about their new venture. "It hasn't really sunk in yet," said Ellen, who has worked as the store's framer for several years. "Sometimes I'll walk outside and think, 'Wow, that's our store.'" "The newness of it is exciting," Dave added. The Andersons have appreciated connecting with their customers. "People have been so wonderful," Ellen said. "It's so cool to walk down the street and have people wave." The Artsmith offers art and office supplies, framing, printing and several other services. The store has also recently acquired a wide format printer, which allows printing of larger items such as posters and blueprints. Ellen and Dave hope to continue the store's established traditions and create new ones. The building's back room, which was previously dedicated to storage, has been opened and will be home to a variety of classes. So far, offerings have included card making courses and informational meetings about doTERRA essential oils. In the future, the Andersons hope to connect with local artists for additional educational offerings. "We want to get local artists in here to teach classes," Ellen said. "We want to have a calendar where artists can sign up (to teach)." Other future hopes for the store include the addition of a selection of fabrics for purchase. "It's definitely a future possibility," Ellen said. "Fabric selections would be good for the quilters." The Andersons want customers to feel comfortable at The Artsmith. Hot chocolate and cider are available, and a Christmas tree decorates the store's back room. "We want to make it a business where people come in and they feel homey, and it's a place where they want to be," Dave said. They have enjoyed talking to people who visit the store. "I love customers. I love having people come in," Ellen said. "It's fun to connect names with faces and have regulars who come in."